Crabulon: Shufflebot. Not sure I will get as far as a active weapon on this one at the moment. At the moment all 4 are in the design phase. Going to save my spinner aspirations for the next AWS at least. 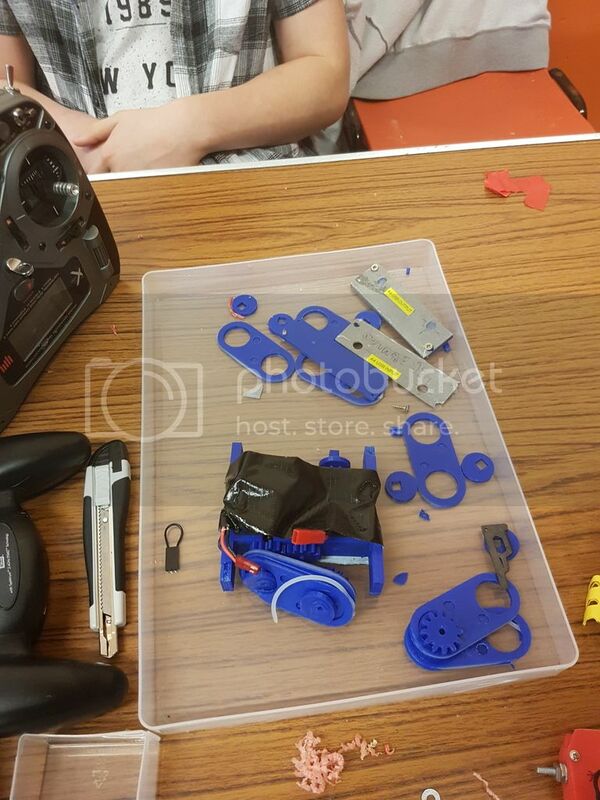 The aim for this AWS is for me to finally get 3D printed bots to a AWS. Not 100% there but getting close to printing some pretty good looking parts out of ABS. hopefully means I will have some assembled bots soon. The PLA test version of Crabulon weighed in at 160g with 20% print. Still lots of weight to add armor, weapons etc but I have redesigned it to use less material for the final print. Id ideally like it to be under the wheeled ant limit prior to any additions. 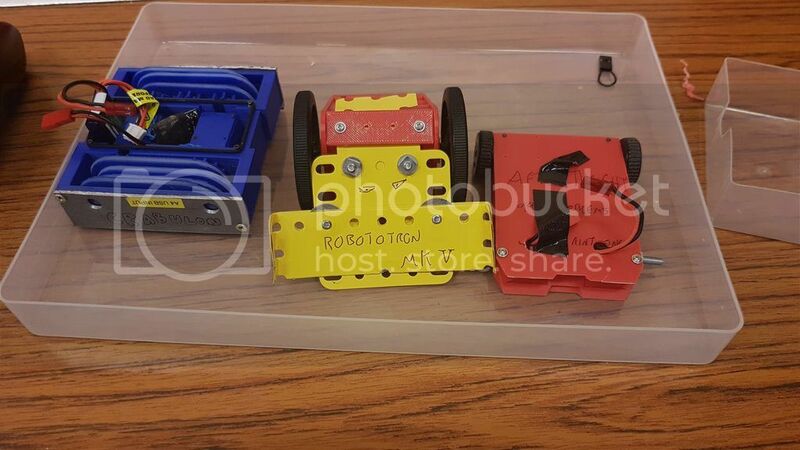 I still have hopes of all 4 bots making it to AWS 56 at the moment. Robototron MK 5: 2WD wedgebot that was frankensteiend from Mecano and 3d printed parts. Afterthought: a test chassis we put in last min. Also has Shaun along as a team mate in order to entice into the hobby. we only one one fight via the other robot being unable to continue. so no real wins. Shuan did a good job with driving the two wheeled bots despite them being horrible to control. despite loosing every match, Crabulon did a great job, Despite loosing 4 legs in a altercation with horizontal spinner of doom we managed to cobble it together to come back. so for next time I want to focus on making a solid wheeled robot, optimise Crabulon and add weapons! Well done with the bots. I really like your shuffle drive. Well deserved sportsmanship award re assembling the bot after getting smashed apart. 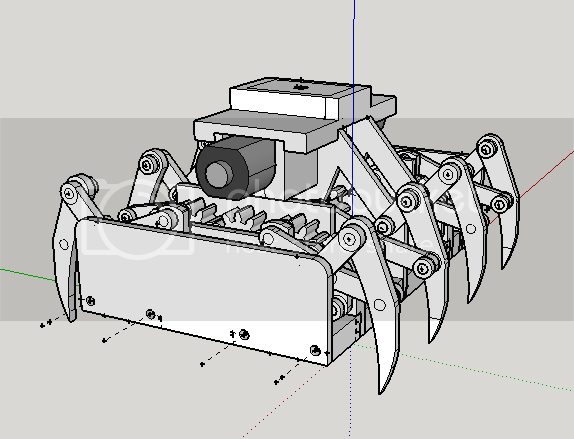 I spent a good Sunday afternoon starting design on the next Crabulon. I shall post some screen shots soon. This would be the right thing to do. It would have to be a full body spinner. Fun trivia: the original Robototron corpse (because that all it is now) is now signed by Evil scarecrow. Also: Evil scarecrow would be a great name for a robot. 2014 Evil Scarecrow opening slot per chance? I managed to get printing with ABS but has cause some issues. Is PLA + worth using and is it standard PLA temps? So my plan for Ant freeze / AWS 57 is weapons. Of all the ants I have made, only one had a weapon which lasted about 3 seconds thanks to a horizontal spinner. So I plan at this point to have 4 bots for those events. Robototron The MK 5 at AWS 56 was a Frankenstein of a bot built from what I had to hand. I love the ant weight Loader with its hair band-based track system. So I hope to simplify the design of MK 5 to make an invertible track bot in a similar style. weapon wise I’m currently thinking a plow/ lifter arrangement of some form. Huricianado I said I want to make a spinner. I stand by that Idea. So, It’s fitting that Hurricanado be the bot to do it. current plans are some kind of plastic derived full body spinner, tho This may change so something that can make be adapted from the Robototron chassis (common parts always being good. before my change of heart regarding Crabulon the plan was to be that Crabulon and Robototron would be the same chassis with different drive pods, an idea I may revisit). Oaf 3: This is all ready designed but was unable to print prior to AWS 56. Basically, it’s the ball concept but using a icosahedron rather than a ball. For those not in the know. The icosahedron is a 20 sided shape and the shape of the 20 sided dice used in D&D. Hence Oaf 3s full name: Oaf 3: Critical fail. So thats the plan. I will try and update this with pictures and what not as the plan develops and changes. still have to fit batteries and Electronics. which way does it move? flat bit forward, or legs forward?